Please follow this Link to our Climbing Club’s Facebook Page. Charleston Academy Climbing Club was established in 2011 for all pupils with an interest in climbing. The club meets every Thursday at Inverness Leisure Climbing Wall . Senior Climbers – 4pm – 6:30pm (and those enrolled on the NICAS Scheme). NICAS is a nationally recognised scheme that allows young people to develop skills in climbing whilst gaining accreditation for achievement. More information about NICAS is available HERE. When the weather allows sessions are run outdoors at a local crag which normally finish about 9pm. On occasion trips are organised to visit other climbing walls and crags across Scotland. For sessions held at Inverness Leisure a normal entrance charge to the sports centre is payable. When attending climbing sessions outdoors, a small charge is payable for use of the school minibus. Climbing offers young people the opportunity to develop teamwork skills through trust and communication. It allows pupils to build their self-confidence by challenging their physical and psychological abilities as well as providing an opportunity to improve fitness and strength. In recent years pupils from the Charleston Academy Climbing Club have competed and been very successful in national competitions. Climbing is an adventurous activity and falls under the Highland Council Adventurous Activity Policy. 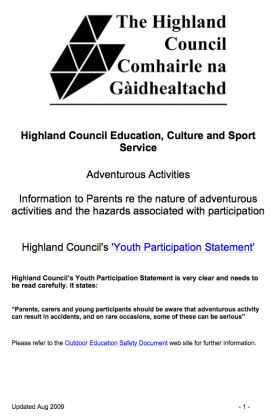 Parents and carers should familiarise themselves with the “Youth Participation Statement” provided by the Highland Council and the information included in the Information for Parents & Carers in the adventurous activities document which is also available below. For consent forms and further information please contact Mr Richards.